Please take a few minutes to see how Komen Ozark worked with a local survivor to turn her story into action. 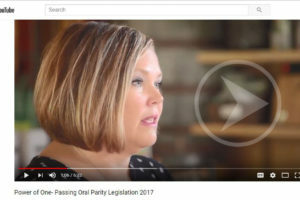 Last year, Komen Ozark worked with Representative Greg Leding to pass oral parity legislation in the state of Arkansas. This legislation now ensures that insurance companies cover oral chemotherapy at the same rate as chemotherapy administered through an IV. This video is about how one person and one story can make a real difference in the lives of so many! Please help us continue our mission of helping LOCAL women by making a financial commitment today. You can donate here and register for our 20th Anniversary Race for the Cure here.